A holiday overseas is meant to be relaxing right? So why do we always get our knickers in a twist just before takeoff? Arriving late to the airport, rushing through security only to find out you have twenty minutes before your gate closes and it’s on the other side of the terminal… Happy holidays indeed. Having just upgraded their dining options in a multi-million dollar reno, the Brisbane International Airport terminal has really upped it’s culinary game of late. Fancy a cocktail and dinner? Craving an indulgent snack and a coffee? Forget the food courts of old, this is the airport dining of your in-transit dreams. So don’t wait to be fed out of a metal tray and plastic wine glass in-flight, start your holiday the right way, with a little indulgence and some well-deserved extra you time. Here’s our picks of your must-do’s at the Brisbane International for the next time you fly. With uninterrupted views of the runway (who doesn’t love watching the big wings taking off? ), and a super slick fit out that screams ‘holiday mode’, this is the perfect spot to order a pre-flight cocktail (or two; their mixologist is a gun behind the bar) and a mezze platter. Stocking up the fridges with local craft beers courtesy of Brisbane brewery, Newstead Brewery, and a dangerously good selection of Australian wines, settle in for a seriously relaxing sesh before boarding! Looking for a quiet spot to watch the world rush by can be a tricky venture in an international terminal (it’s people watching on steroids! 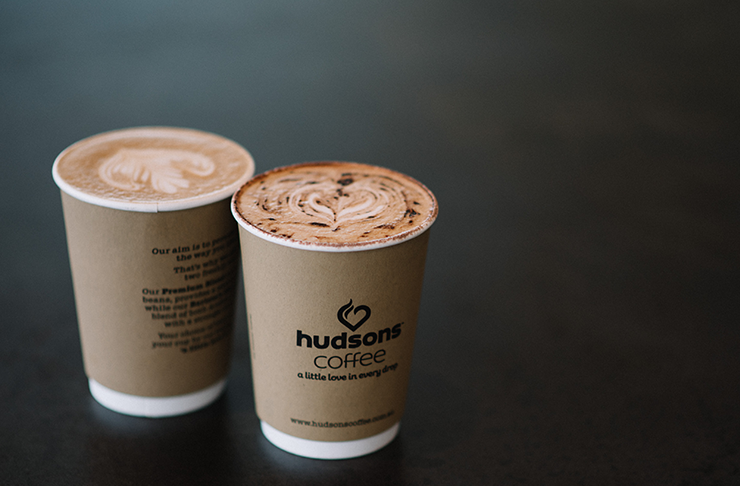 ), so Hudsons Coffee is a very welcome oasis in the storm. Whether you’re knocking an espresso down the hatch before takeoff, or have time to cosy up with a good book and a latte on one of the sun loungers, this is a coffee lover’s paradise. 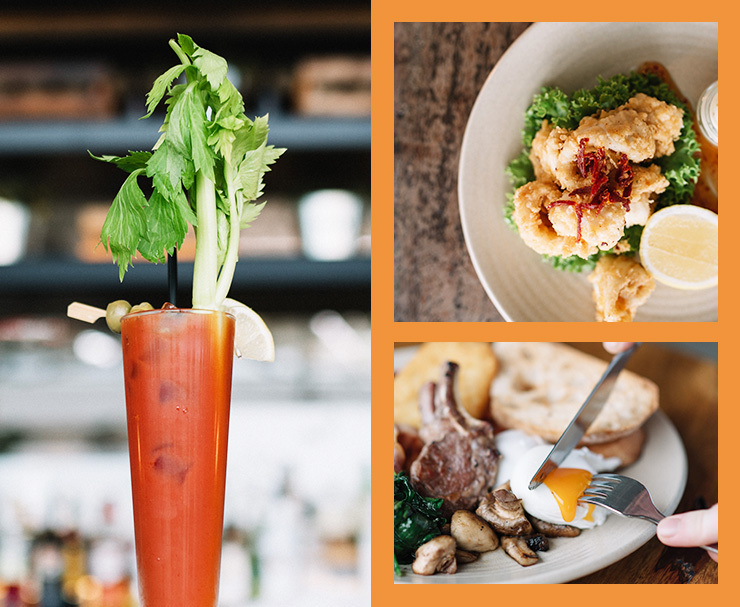 Flying the flag for local QLD produce, Brisbane River Grill is your go-to for delicious dining with a local twist. You want iconic Brissy flavours? You’ve come to the right place! Breakfast has a real local twist; Tamborine Mountain free-range eggs, St Omer Meander Valley Butter and honey sourced from Winfield, all rounding up the best meal of the day, not to mention fresh, daily baked bread courtesy of Le Bon Choix! The rest of the menu also features some top shelf local produce, from Moreton Bay Bug spaghetti —a must-eat!—to Queensland caught snapper and Rangeland Darling Downs beef. All this plus local brews on tap and decidedly decadent cocktail jugs, Brisbane River Grill serves up true QLD spirit in spades! Want to really kick-start your holiday? 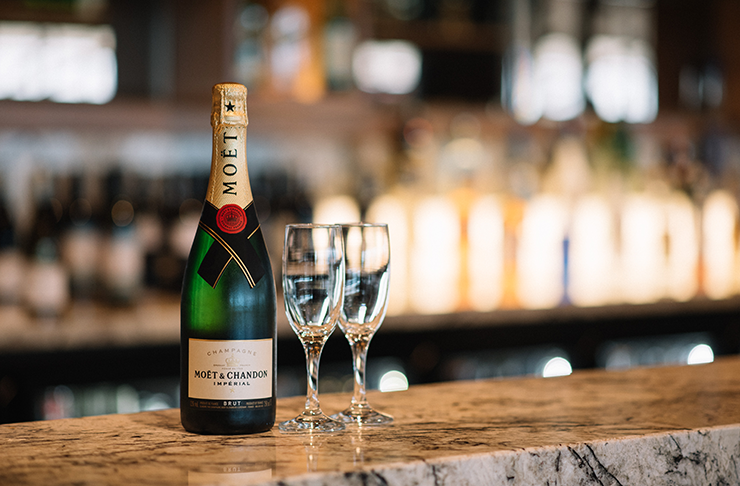 A glass of bubbles at Corretto Café & Bar is the ultimate pre-flight treat! Kick back, catch the live bands belt out your favourite classics, and kick it back to neutral. Arrived late but need a quick bite before you fly? The brand spanking new dining quarter also has some quick and delicious options for you to eat and run; classic Asian snacks at Tuk Chop, fresh juices and smoothies at Boost along with all of your favourites! Slap bang in the middle of the terminal you’ll find The Village Green. Not a bar or a restaurant, this is a super chilled spot where you can sit and relax on the turfed ground and amongst the palm trees. 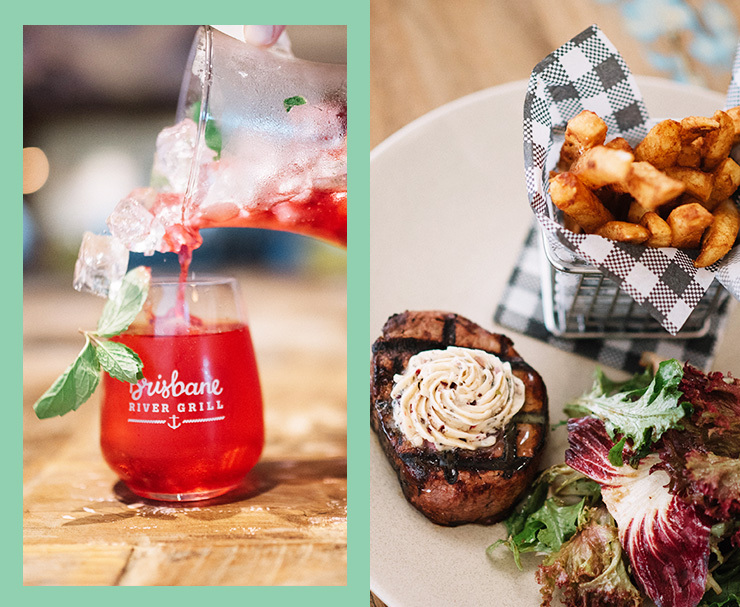 Play a game of giant chess or checkers, and if you do get peckish, nearby restaurants Windmill & Co and Brisbane River Grill will put together specially made picnic hampers designed for sharing. Next time you’re off on your hols, make sure to claim back those first few hours before your flight; have a drink, dine in style, and get holiday happy. Bon voyage! Editor's Note: This article is proudly sponsored by Brisbane Airport and endorsed by The Urban List. Thank you for supporting the sponsors who make The Urban List possible. Click here for more information on our editorial policy.